The JEDEC published the UFS Card 1.0 specification back in mid-2016, and shortly after that Samsung introduced its UFS cards with 32, 64, 128, and 256 GB capacities. In the meantime, neither Samsung nor any other maker of electronics has introduced a device supporting such cards. The situation may change in the coming quarters as at least two developers of controllers — JMicron and Silicon Motion — are about to launch their UFS to USB bridge solutions for card readers. 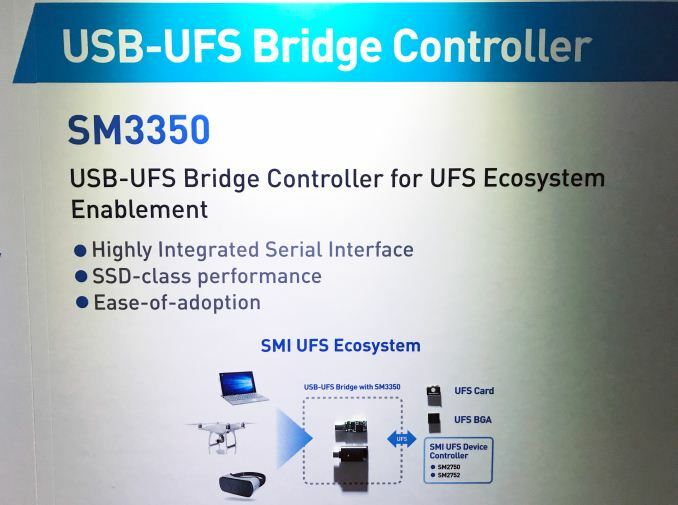 Silicon Motion already offers its clients the SM3350 USB 3.1 - UFS 2.1 bridge (UFS Card 1.0 is a part of the UFS 2.1 spec) as well as the SM2750 and SM2752 UFS 2.1 device controllers required to build UFS memory cards and embedded storage solutions. 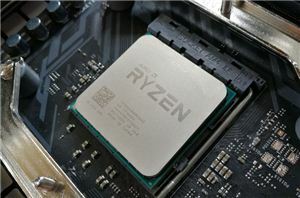 The SM3350 is still not listed on Silicon Motion’s website, but the company says that its customers can buy the said chips and build cards and card readers for PCs or other devices now. To prove its point, SMI demonstrates two USB card readers for UFS cards. In addition, the company has various UFS solutions for industrial/automotive applications, but they are beyond the scope of this news story. Since SMI only sells controllers, it is uneasy to say when actual products on their base will be available. Meanwhile, the important thing is that the chips are here because back in 2017 SMI did not offer these ICs (integrated circuits) at all. Moving on to JMicron. JMicron is prepping its JMS901 USB 3.1 - UFS 2.1 bridge that will also support UHS-I for backward compatibility with SD cards to enable manufacturers to build universal card readers. 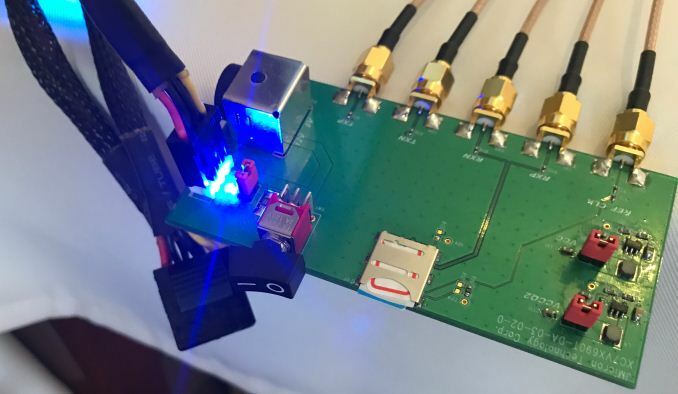 The company expects the controller to support sequential read/write speeds of up to 450 MB/s (because of the UFS 2.1 Gear3 interface) as well as up to 30K read/write random IOPS. 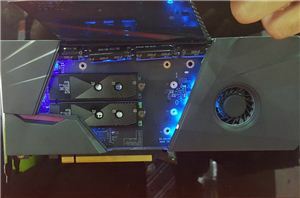 JMicron does not have the JMS901 silicon at hand just yet: at Computex the company demonstrated the project to select customers and press using a Xilinx Virtex-7 FPGA and custom PHY. JMicron expects to receive the chip from the fab in July and if all goes well, the JMS901 will be available to JMicron’s customers later this year. Considering the fact that there is nothing too complex about this bridge, it is likely that its very first revision will go into production. 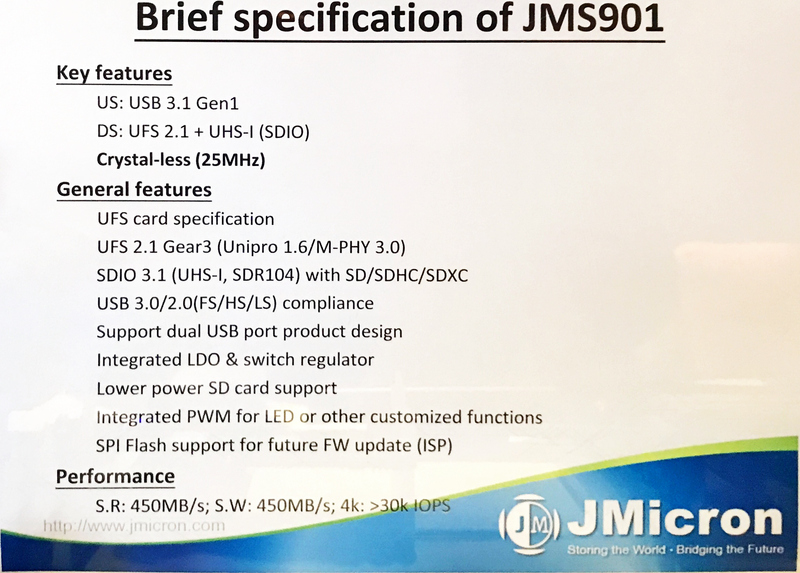 Neither JMicron nor SMI discloses quotes for their UFS 2.1-supporting products, but since we are talking about really small consumer-grade chips, their prices are not supposed to be high. 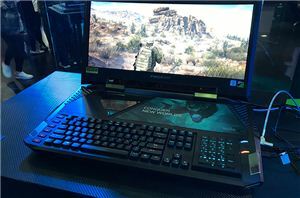 Meanwhile, a big question is whether makers of PCs and other hardware get interested to incorporate UFS card readers considering the fact that there are no mass-market smartphones or cameras that use such cards. As reported, Samsung launched a lineup of UFS cards that offer an impressive sequential read performance of up to 530 MB/s and sequential write performance of up to 170 MB/s. As for random performance, then Samsung spec'd its 256 GB card for 40,000 read IOPS and 35,000 write IOPS for the 256GB version. 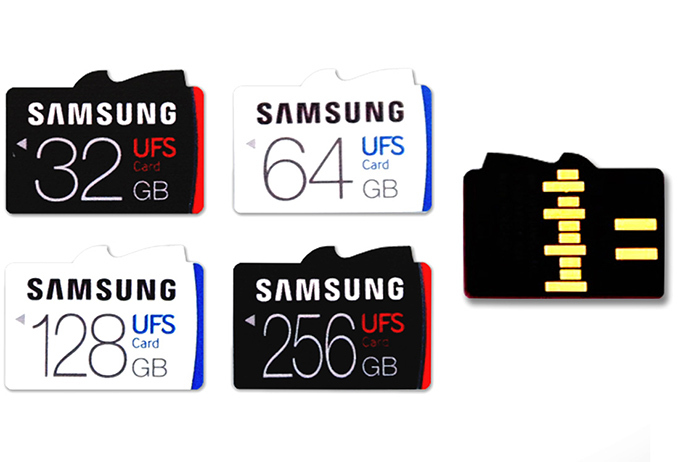 Despite all the potential advantages that UFS cards can bring, even Samsung does not integrate UFS card readers into its Galaxy smartphones that are sold in hundreds of millions of units. 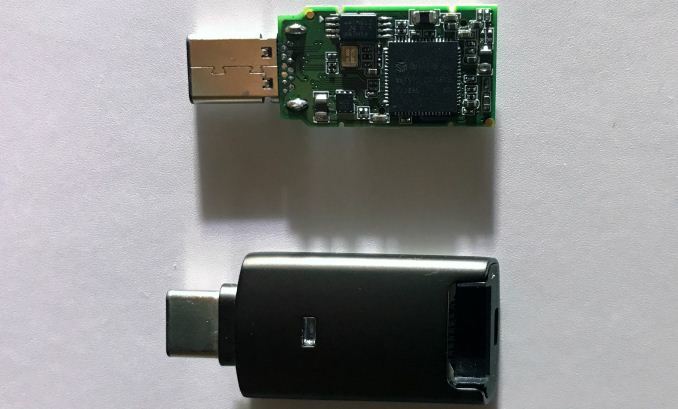 A launch of a Samsung smartphone with a UFS card reader could skyrocket adoption of almost any technology, including UFS, but we will have to wait for one of such devices. What's going on with the portable card format? We have UFS that has never seen any widespread use in the card format due to lack of controllers/slots but marketed as a replacement for SD cards. Meanwhile a new SD standard using PCIe in some fashion has just been announced.